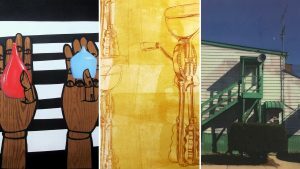 The Harrison Center for the Arts announces “Assembled,” new work by Christina Hollering, Lauren Ditchley & Katherine Fries with an artist reception in the Harrison Gallery, Friday, June 3 from 6 to 9pm. Through various mediums these artists engage in a dialogue with their materials, exploring the idea of collections and their significance with regards to memory, place, object, and association. As the photograph, print, or mixed media pieces take shape these artists are looking to the objects ever present in their physical and mental spaces. They situate themselves on the fine edge of sentimentality and examination of what we keep and why we keep it. Christina, Lauren, and Katherine ask the viewer to consider the collective human experiences that we engage in with objects. The City Gallery presents “Herron, Sewall and Steele.” This group show honors prominent culture builders who shaped the story of the arts in Indiana. This exhibit celebrates the work of May Wright Sewall, founder of the Art Association of Indianapolis; John Herron, unexpected funder of the State’s first art museum and art school; and T.C. Steele, Indiana’s foremost painter (also a founding member of the Art Association). The show will feature new commissioned works of art and spoken word ballads inspired by the stories of these cultural leaders whose lives and legacy contributed to the historic John Herron Art Institute (now Herron School of Art and Design), and whose actions advanced art, culture and social justice throughout our State. Contemporary Indiana artists were selected to create art inspired by their stories. “Herron, Sewall and Steele” is a signature project of the Indiana Bicentennial Commission and is made possible, in part, with support from the Indiana Arts Commission. The Gallery Annex will feature “Day Tight,” new work by Patrick Tisdale. Tisdale describes this as “a distinct departure from my previous work, after a particularly stressful moment in my world. The first 6 paintings of the body of work were done one night after another, 6 days in a row, 18 months ago. These 6 paintings were an effort to end my day with a bit of simple joy.” Also in the Gallery Annex will be work by Judy Jarrett Gier, and Kyle Channing Smith. In Hank & Dolly’s Gallery, found object and assemblage artist Chad Campbell marks 20 years’ making art with his show, 99Luftballons. The show pays homage to the incandescent light bulb. The art, which can also be seen at the Saturday, June 11 Independent Music + Art Festival, hangs through June 24. A member of IDADA – Indianapolis Downtown Artists and Dealers Association – The Harrison Center serves as a catalyst for renewal in Indianapolis by creating awareness, appreciation, and community for art and culture. The Harrison Center is dedicated to serving both “emerging artists” and “emerging patrons” through engaging exhibits and concerts, educational programs and art programming for youth. In addition, the Harrison Center provides below-market studios for individual artists and office space for arts and cultural organizations. For more information, visit www.harrisoncenter.org.